Paul Rader had visited for graduation. A former college president of fine Alabama pedigree delivered the Baccalaureate address. Local boosters pasted on salesman smiles. College promotions had never been more glittering. Just like today. But their salad days were gone. Bankrupt. Into the hands of a receiver. Just four months ago it was an “outstanding asset” with “fewer changes” than any other institution known to modern man. Now, with everything was operating on a cash basis, it couldn’t pay its original creditors. It couldn’t make good on the bonds. It was decided that a receivership was the best policy for the safeguarding of the interests in the college. While the institution, like many other businesses, has felt the sting of the depression, it has been meeting its current operating expenses, and the receivership, it is stated, was the result of a hangover from the bonded indebtedness of six years ago. 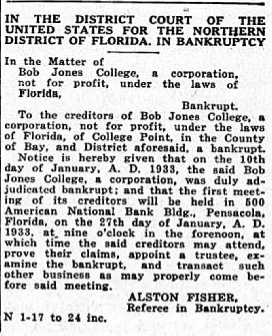 Who was the person going to be responsible to receiving Bob Jones College’s debts and seeing that its investors got their money? A lawyer? A banker? A rich benefactor? Jennie Brandenberg? Governor Graves? The Honorable J. M. Sapp? Bob Jones, Sr. himself. He got it all. Looks like a sellout by BJSr. What a cliffhanger! Staying tuned for the next installment to find out who he sold out to.